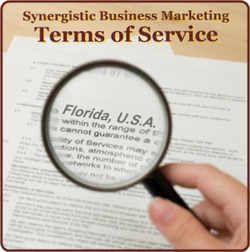 By using Synergistic Business Marketing services, you agree to be bound by the following terms and conditions. Synergistic Business Marketing reserves the right to change the Terms and Conditions at any time without notice, and your continued use of Synergisitc Business Marketing constitutes your consent to such changes. 1. DESCRIPTION OF SERVICES. Synergistic Business Marketing will provide an ongoing set of online and offline services specific to any agreement between client/customer and Lamar J. Morgan and his associates. Where associates are needed/used payment may be either to Synergistic Business Marketing or to the associate directly. The right to decide payment options will be at Lamar J. Morgan's discretion. 2. LIMITATIONS OF SCOPE. Synergistic Business Marketing shall not be responsible for work that is beyond the scope of services set forth in any formulated plan in effect at the time Client initiates the service. Any changes to the scope of services will not be effective unless approved by both parties. 3. MANAGEMENT RESPONSIBILITY. 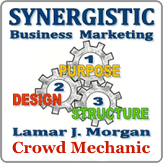 Synergistic Business Marketing shall provide certain tools, methods, resources, and/or products to Client that are intended to help Client grow and build its business. However, Client is fully and exclusively responsible for its own business performance and Client satisfaction. In addition, Client has full and exclusive responsibility for understanding and ensuring compliance with any regulatory, legal or contractual obligations related to Client’s business, including without limitation, data held by Client and its Clients, information provided by Client to Clients and/or other third parties and any safeguarding and security measures that may be required. Synergistic Business Marketing may participate in implementing needed systems services and functions, but Client is solely responsible for the final outcomes, actions taken and results produced. 4. COPYRIGHT. All content produced by Synergistic Business Marketing within the scope of Services including items by associates: software and web code, contents, graphics and design, or material developed or licensed by Synergistic Business Marketing for Client as part of the Services is copyrighted by Synergistic Business Marketing and/or associates and remains the exclusive property of Synergistic Business Marketing and/or associates. Upon termination of this Agreement copyrights shall remain with Synergistic Business Marketing. After twelve months of service and full payment if Client chooses to cancel this agreement per the conditions in Section 6 below all Synergistic Business Marketing copyrighted content, EXCEPT software, web code, WordPress themes and plug-ins, PSD files and other files or code used to create web content for Client and/or newsletter or other materials can be used indefinitely by Client for their company, newsletter and other marketing collateral. This use will be restricted to the Client company use only and Client does not have any rights to resell, license or otherwise allow 3rd parties use of the content. Some materials may be copyright through an associate. Those items will be noted and are included in this agreement. Graphics, photos, or other art materials may be subject to copyright by an associate. Under these circumstances, Client is allowed use but copyright remains with the named associate and named associate has permission to place copyright notice on some graphical art or photo materials or products. In the event Synergistic Business Marketing ceases business operations and providing the services described in this agreement, all Synergistic Business Marketing copyrighted content, EXCEPT software, web code, WordPress themes and plug-ins, PSD files and other files or code used to create content for Client and/or newsletter can be used indefinitely by Client for their company, website, newsletter and other marketing collateral. This use will be restricted to the Client company use only and Client does not have any rights to resell, license or otherwise allow 3rd parties use of the content. 5. LINKS. Customer hereby acknowledges and agrees that Synergistic Business Marketing shall have the right to use the name of Client, including the Client Web Site and content therein, for reference as a customer of Synergistic Business Marketing services for referral and marketing purposes. Testimonials from anywhere on the web may be used on the Synergistic Business Marketing website, at our sole discretion. 6. TERM/TERMINATION. Except for reasons of non-performance by either party, this Agreement shall remain in effect until formally terminated in writing by either party. Synergistic Business Marketing will start billing to Client beginning the date client agrees to these terms of services and it shall automatically renew for subsequent one (1) month periods or agreed upon time limitations until it is formally terminated in writing or email. Termination of this Agreement requires written or email notice delivered thirty (30) days prior to the desired date of termination. A repeated failure to make payment by date due during any period gives Synergistic Business Marketing the option for immediate termination. Upon the expiration or termination of this Agreement for non-payment or non-performance by client, (i) all licenses granted by Synergistic Business Marketing to Client here-under shall automatically terminate and Client shall immediately cease its use of the licensed content/product/service and other provided marketing collateral, and (ii) Client’s right to the Services afforded to Synergistic Business Marketing's Clients shall automatically terminate. Client has the option to pay directly to Lamar J. Morgan or institute a billing cycle as may be required by Synergistic Business Marketing upon agreement to provide services. 7. PAYMENT FOR SERVICES. Client will pay required, quoted fees to Synergistic Business Marketing for Services rendered as described in any coordinated plan in effect at the time of this agreement and for the license to use the Synergistic Business Marketing online/offline services, software and licensed content in conjunction with these services. Payment will be made by whatever agreement becomes necessary between Synergistic Business Marketing and Client. Invoices may include fees due to any associate involved and will be noted and/or any additional fees for elective or other additional Services that have been purchased by the Client. Invoices will be issued and transactions processed upon receipt of payment as described in Section 6 above. Synergistic Business Marketing reserves the right to assess and collect late-payment charges of 5% per month on past due balances. 8. WARRANTY. Synergistic Business Marketing shall provide its services and meet its obligations under this Agreement in a timely and professional manner, using knowledge and skills consistent with generally acceptable standards in Synergistic Business Marketing's industry, and will provide a standard of care based on commercially reasonable efforts. The services and all products provided as part of the services are provided “as is” and Synergistic Business Marketing disclaims, and client waives, any warranties, express or implied, as to the merchantability, fitness for a particular use or purpose, title, non-infringement or any other warranty, condition, guaranty or representation related to the services. Synergistic Business Marketing does not warrant that the products/services or any printed materisls provided here-under will be uninterrupted or error-free. Under no circumstances, including negligence, shall Synergistic Business Marketing be liable for any direct, incidental, special or consequential damages or otherwise, including any damages that result from the use of or inability to use the products/services/software. Synergistic Business Marketing shall not be responsible for any damages whatsoever that result from mistakes, omissions, interruptions, deletion of files, errors, defects, delays in operation or transmission, or any failure of performance. 9. LIMITATIONS OF LIABILITY. Except to the extent finally determined to have resulted from the gross negligence or intentional misconduct of Synergistic Business Marketing, Synergistic Business Marketing's liability to pay damages for any losses incurred by client as a result of breach of contract, negligence or other tort committed by Synergistic Business Marketing, regardless of the theory of liability asserted, is limited to no more than the total amount of the most recent three (3) months of basic fees paid under this agreement. In any case, Synergistic Business Marketing and its licensors shall not be liable for lost profits or any consequential, indirect, punitive, exemplary or special damages. In addition, Synergistic Business Marketing shall have no liability to client arising from or relating to any third party hardware, software, information or materials. Synergistic Business Marketing is also not liable for direct or indirect damages created by viruses, hackers or other malicious or accidental destruction of systems or data, though Synergistic Business Marketing will attempt to prevent or minimize exposure to such risks. Inasmuch as Synergistic Business Marketing does not directly provide website development or website design, they shall be free of responsibility of such services that may be provided by associates or other third parties. 10. INDEMNIFICATION. Subject to the provisions hereof, Client shall indemnify, defend and hold harmless from and against any and all amounts payable under any judgment, verdict, court order or settlement for third party claims brought against Synergistic Business Marketing and its licensors or associates arising from products or services related to this Agreement. Conversely, Synergistic Business Marketing shall indemnify, defend and hold harmless from and against any and all amounts payable under any judgment, verdict, court order or settlement for third party claims brought against Client arising from the gross negligence or intentional misconduct of Synergistic Business Marketing. 11. GOVERNING LAW. You agree that these Terms and Conditions shall be treated as though they were executed and performed in Florida, United States of America and shall be governed by and construed in accordance with the laws of Florida, United States of America (without regard to conflict of law principles). All legal proceedings arising out of or in connection with these Terms and Conditions or any other agreement related to the use of Synergistic Business Marketing services shall be brought solely in Florida. Synergistic Business Marketing is located in Tamarac, Florida, United States of America. Contact is available on every page of this website. Synergistic Business Marketing or associates (Buddy Web Services or other entities).